About the Event - In the aftermath of the foreclosure crisis, metro Atlanta leads the country with 35% of homeowners underwater on their mortgage loans (Haas Institute, 2014). Housing recovery in the region has been wildly uneven. The slow rising tide of home prices in affluent neighborhoods has bypassed large portions of metro Atlanta, particularly communities south of I-20 and along portions of the I-85 corridor. 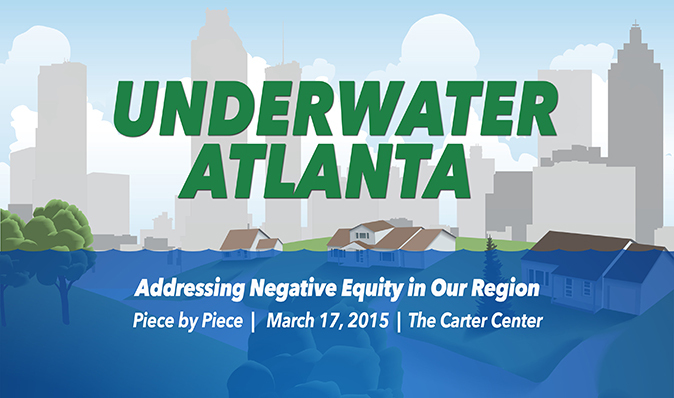 On March 17, 2015 representatives of 200 organizations attended the "Underwater Atlanta" event to learn more about the issue of negative equity and to engage in a dialogue about solutions to the problem. Race and Uneven Recovery: Neighborhood Home Value Trajectories in Atlanta before and after the Housing Crisisby Dan Immergluck, Elora Raymond and Kyungsoon Wang. Contact Susan Adams at sadams@andpi.org or 404-420-1595.